A farmer or a mago (pack horse driver) and his horse packed with rice bales. The horse wears straw horse shoes to protect the hooves. Japanese horses were small, but as strong as European horses. 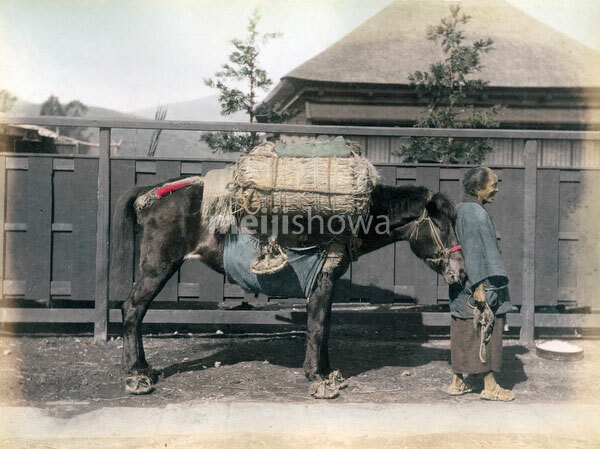 Pack horse drivers were looked down upon by townspeople and a common expression, used as late as the 1940s, was as barbarous and uneducated as a rickshaw man or pack horse driver (車夫馬丁の輩, Shafu batei no yakara).